Dennis Henry Wolf – my first cousin once removed. Born July 9, 1945, in LaSalle County, Illinois. 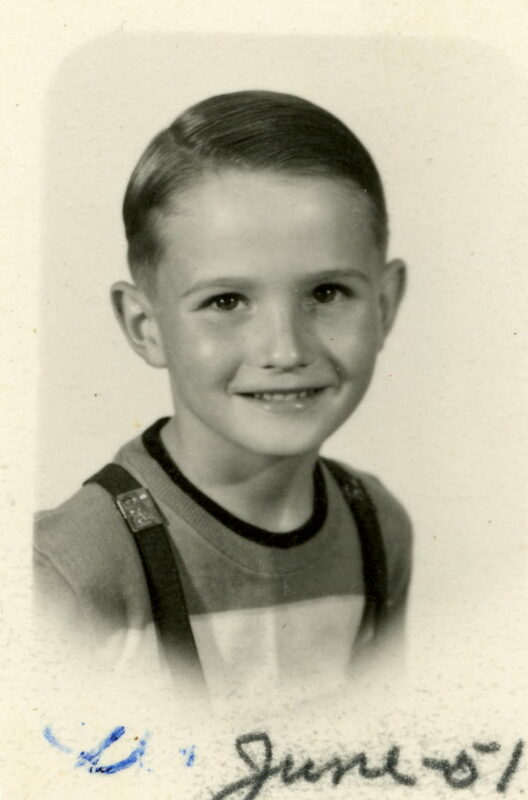 Meet Dennis Wolf, my mom’s only maternal cousin, who was born on July 9, 1945. My mother was 13 at the time of his birth so definitely old enough to understand just how much this new baby boy meant to everyone, especially his parents. The story of his birth and the happiness it brought to everyone was constantly talked about in our family. 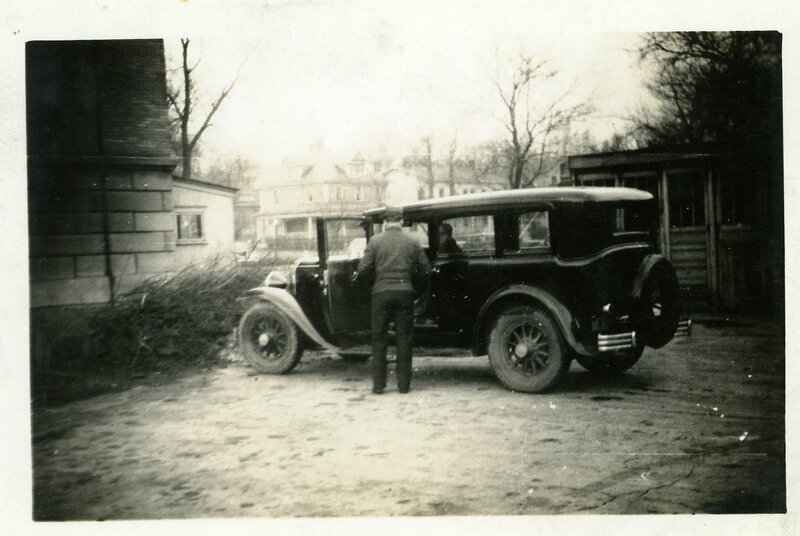 Dennis was the only child of Aunt Frances, my grandmother’s sister, and her second husband, Henry “Bear” Wolf. Frances had lost her first husband when he passed away only a few years after their marriage – they had no children. Bear had also been married before and also lost a spouse, but being about 18 years older than Aunt Frances, had two adult sons from his first marriage. Frances and Henry “Bear” Wolf. Frances and Bear married as World War II was beginning and had their son, Dennis, the year the war ended. 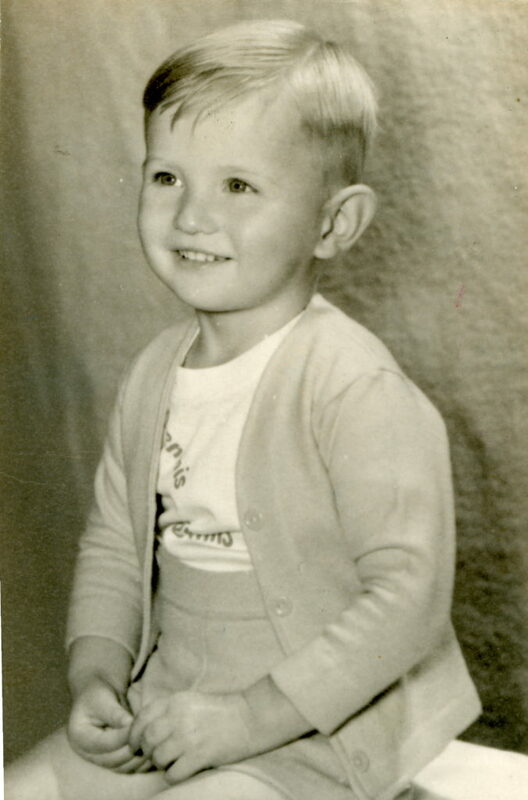 Dennis Wolf at age 6 – the son of “Bear” and Frances Wolf. He passed away a year after this photo, a month before his seventh birthday, on June 8, 1952. Although physically gone, Dennis lives on through the expressions of love and through, what I now understand to be, sorrow. As much as the love for him brought a smile and wistful look, his loss brought sadness and tears to the eyes of every family member. And I am sure his death is one of the main reasons my mother made sure we were vaccinated as babies even scrapbooking the proof of it in our baby books. 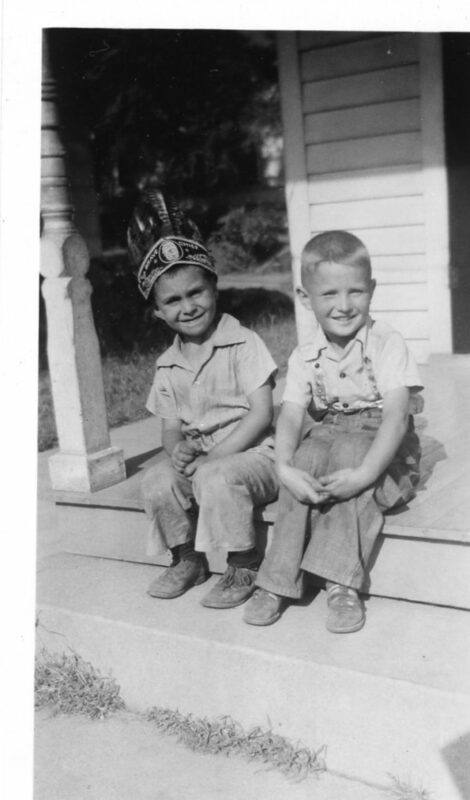 Dennis, on the right, sitting on his porch with his friend. Unfortunately for me, the measles, mumps, and rubella (MMR) vaccine was not yet available when I was a child. According to my mom, I contracted them all over the years, fortunately not all at once. The only one I remember is the mumps which due to the severity of the case I had caused my little head to swell to grotesque proportions. My experience was horrific enough that when I had my own children twenty years later, I made sure my babies were all vaccinated so they would never have to go through that. 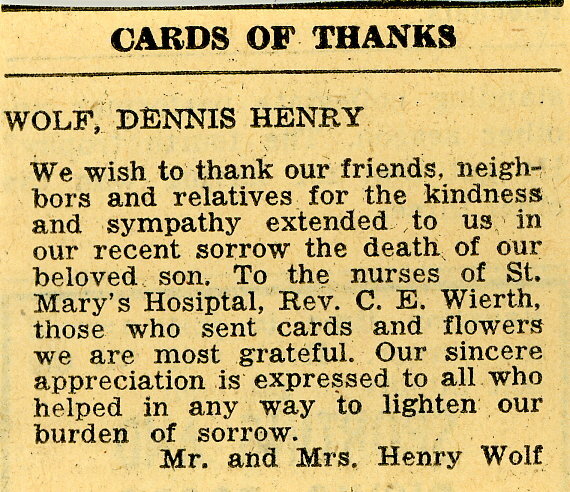 Newspaper clipping posted by his parents after the death of their son, Dennis Wolf. All of Dennis’ relatives are gone now except for me, my brother, and Uncle Louis – my mom’s brother. We all carry on the story of “little Dennis” and so far those of my children who have their own kids are definitely choosing to protect them by ensuring they are vaccinated. Today I decided to share the story with all of you because I fear people are forgetting the losses, the ever present sorrow, and the sadness of a life lost too soon. People no longer remember the family stories of how a sweet and loveable child who means everything to a family slips away while those who love him look on helplessly. Except today we are not helpless, and perhaps by sharing stories of #whyivax can help others understand its importance, spare the loss of loved ones before their time, and give a little boy or girl a fighting chance. The gravestone of Dennis Wolf in Peru City Cemetery. Earlier this year I was finally able to reconcile my genealogy research with my DNA. The key outcome of this effort was the realization that my birth father was not actually the person my research had led me to. 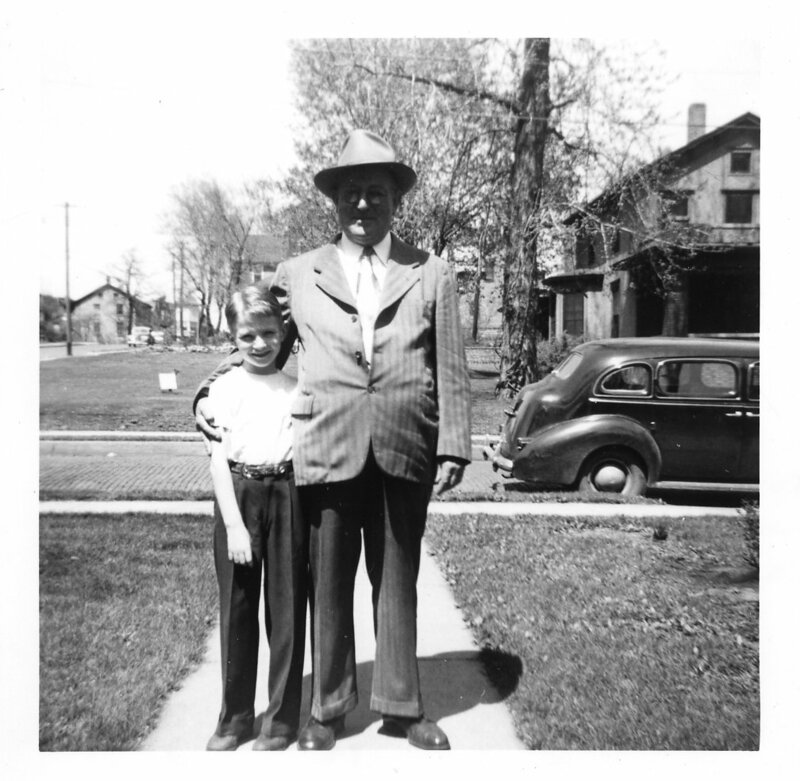 Because this experience is a good example of the importance of DNA in researching family history, I blogged about the experience and related work that led me to my actual birth father over on another site I set up: Finding Father – Circumstantial vs DNA Evidence. So based on this new knowledge, I have updated my list of surnames shown on my contact page. As for the older posts related to the family I had thought was my paternal line, I am leaving them up because they could still offer useful family information for anyone else researching that family. Eventually some day, when I have more time, I may end up writing up my research on that family since I have so many records. When I do, I’ll make it available online for other researchers. But for now, I’m working on my new paternal line which has proved to be more challenging. I’ll share some of my work in future posts. To the average person cemeteries can represent a place to completely avoid, revere, find solace or perhaps a little of all that depending on the mood. But to a genealogist, a cemetery represents a place where significant family information can be discovered. For me, even before becoming a genealogist, graveyards were most definitely a place strongly associated with family. Possibly because my mom took my brother and I to cemeteries so much as children to visit relatives who had passed away. Later as a young woman, I gained an additional insight into graveyards after working with a land surveyor laying out new cemetery plots. But it wasn't until I entered a cemetery with a genealogist's driving passion for knowledge did I come to truly appreciate what the cemetery offers. Initially I focused on taking photos and transcribing the information etched into each ancestor's stone. And for those family members whose graves were not local, I at first settled with viewing and collecting photos I found online. Throughout the first year or so of building my tree, I did not truly understand why I needed to go to the actual site. As I got deeper into my research and added new people to our tree, I came to gain a better idea of the true importance of actually visiting your ancestor's grave. Not only did visiting the site where family last gathered to honor the passing of someone’s life offer a type of connection, but I could sometimes find additional clues to their past. The first time I realized I needed to be more perceptive about picking up on these clues was when I returned from a trip to Tennessee where I photographed many graves of family from my birth father’s side. I was having a hard time finding the parents of my 2x great-grandmother, Laura Belle Lawson Hatmaker. At this time, not enough records were online yet to pinpoint the right family. I happen to have the photo of her grave up (the one you can see posted with this article) when my husband pointed out the grave nearby that said “Mother.” While in the graveyard, I had been so focused on just getting the pictures that I didn’t notice that the proximity of the two headstones and the designation of “Mother” on the grave might have meant this woman was Laura’s mother. As you can see from the headstone, it also had the maiden name of Laura’s mother, Cyntha Stanfield Lawson as an added bonus. Take some time to see who is buried close to the graves of your family. Take close up photos of family headstones, but also take some photos of the general area making sure to capture other headstones nearby. 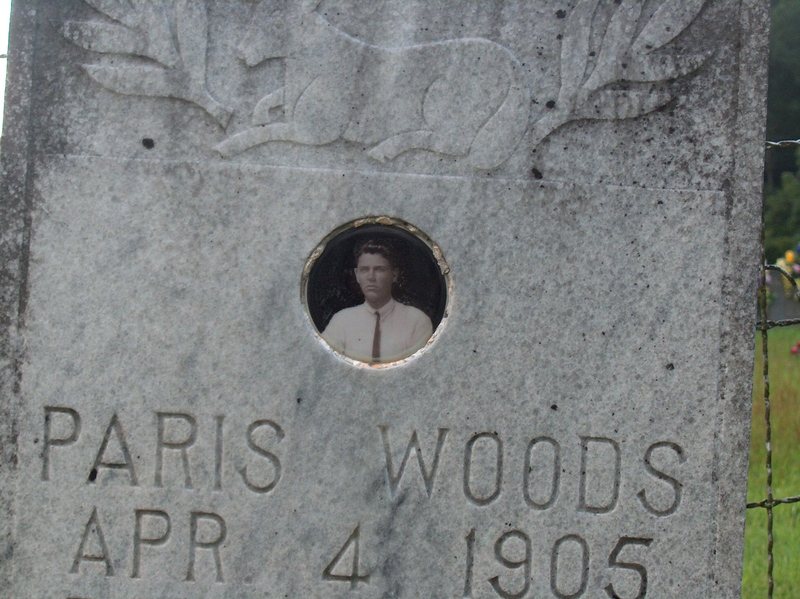 Look for clues on headstones that offer additional information about a person’s life such as symbols designating memberships in societies or titles indicating professions. Take note of any marriage dates or information indicating military service that can be used later to look up related documents. Take note of middle names as sometimes these are actually maiden names. Some graves have photos of the deceased embedded in the stone providing you the opportunity to see what they looked like. Make sure to look on all sides of monuments – sometimes information for more than one person is included on the same stone. And if they are on the same stone, most likely they are related. Look for information indicating birthplace. For example, some older headstones of Irish immigrants include the county or place of birth in Ireland for that person. Before visiting the cemetery, contact the local genealogy group to see if they have listings of the graves and plots of the site so you can better target specific graves. 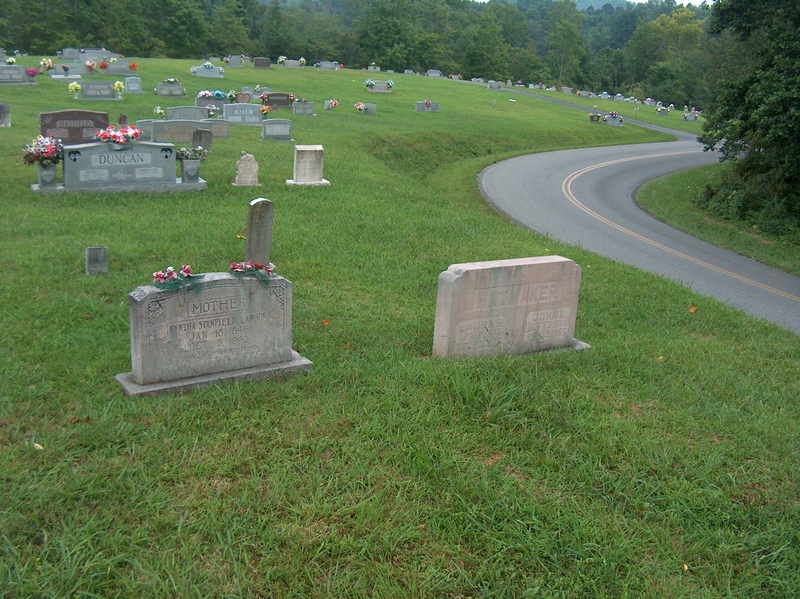 Use tools like Google Maps to get directions or to look over the layout of the cemetery before going. You can also print out maps to bring with you and highlight the graves on the map that you plan to photograph. If possible, meet the sexton – he may know family stories, local history, or have additional information in his records that might supplement your research. Bring clippers to clear away grass from the stone so you can get a better photo. Be careful to use only non-destructive tools. To get a better photo, you can bring a mirror to reflect light as needed or use a wet sponge to lightly dampen the letters to make them more visible. Don’t expect for family members to always have been buried next to each other. Even husbands and wives can be found buried apart from each other or even in different cemeteries. And of course, be respectful and careful while in the cemetery and in walking around and photographing the headstones. For most people, figuring out where you came from is just a matter of asking mom or dad or any other member of the family. Sure you might not get a full family tree back to the 1500s, but at least there’s a good chance you’ll get some idea of a starting point from which you can begin your genealogy research. But for many of us who were adopted, it’s not such a simple matter. However, adoption and the challenges it poses do not have to be reasons to avoid genealogy. So, I’m sharing my own story as an example of what type of research can be done and why I believe genealogy can still be worth pursuing even if you are adopted. My efforts in exploring my family’s past began in third grade in response to an assignment to figure out what countries my family came from. Although I was fully aware at the time I was adopted, I never even thought back then to make a distinction between my own ancestral past and my adopted family’s past. Their story was my story. Perhaps this is because they were always sharing so much about the family, and as my brother and I grew up we too were woven into the family tapestry. But eventually I started to wonder, where did I really come from? Like many adoptions, mine was closed; the records were sealed. Because of this I thought there was really little hope for finding any facts about birthparents much less ancestors. So over the years, I instead focused on the genealogy of my adopted family and expanded my research and skills as more online resources became available. I started to work on family histories for other people. Eventually I got married and had my own children. And for the first time I had someone around who was a blood relation. I also realized as each child was born, in a strange sort of way, I was getting the opportunity to meet my ancestors through my children. I think it was this glimpse into the past that pushed me to take advantage of the ability to request non-identifying information from the agency that handled my adoption. I had not previously done this thinking it would not be worth it – was I ever wrong. Initially all I got was the age of both parents at my birth, their profession, and their nationality. By itself, that did not do much. But it led me to take the next step which was to request the agency to make contact with my birth family to see if they were interested in talking with me. Unfortunately they said no. However, I did find out other critical information from this. My birth mother had just passed away – it was her sister who had denied the request for contact thinking my birth grandmother, who was dealing with this death and her husband’s illness, would not need another thing to deal with. So I took the information I learned which was a range of birth and death dates for my birth mother, her first name, the state where she passed away, the nationality information, and after about eight years of research and waiting for records to come online, I was finally able to figure out her name. Looking back, I don’t think I could have done this if she had not passed away and if I had not had access to genealogy records. The end result was I was finally able to make contact with the rest of the family and eventually meet them. Although this allowed me to begin researching the genealogy of my maternal line, the meeting also provided a type of closure for me. I also think it did the same for my birth grandmother. From what I was told, she was the one who decided I should be given up for adoption or was at least very influential in the decision. She had to wonder all those years if it was the right thing to do, and I think our visit convinced her it was. I had been well taken care of and was raised by a good family. My next challenge came in finding my birth father – with my birth mother gone, I believe only my birth aunt and birth grandmother knew who he was, and they were not telling. So again using genealogy sites, I found several people who I thought might also know his name. I think without these sites and the help of a few critical people I would have never figured out his name. Unfortunately for me, when we did contact him, he was not interested in meeting me or my family at all. But on a more positive note, I was able to talk to other members of his side of the family including his sister before she passed away. Since then, I’ve located many wonderful living relatives on my paternal side to add to those I found on my birthmother’s side. Through my entire search for my birth parents, I made use of many typical genealogical records such as social security indexes, obituaries, public records, marriage indexes, death certificates, newspaper clippings, probate files, city directories, and archived yearbooks. It was not easy; it took a lot of time and patience, and there were frustrations along the way. But that is also typical of genealogy in general. What I also learned as I stepped back through time was that adoptions happened in many families. Sometimes they were openly acknowledged and sometimes they remained hidden until recent DNA testing brought them to light. So even though you might think you are researching a “bloodline” in reality you might one day find it is actually an adoptive line. Overall, the discoveries of my birth family’s past have turned into an amazing adventure that I hope to continue exploring. However, this article would not be complete if I didn’t return to my adopted family. I think of my grandfather on the paternal side of my adoptive family as a kind of patriarch. 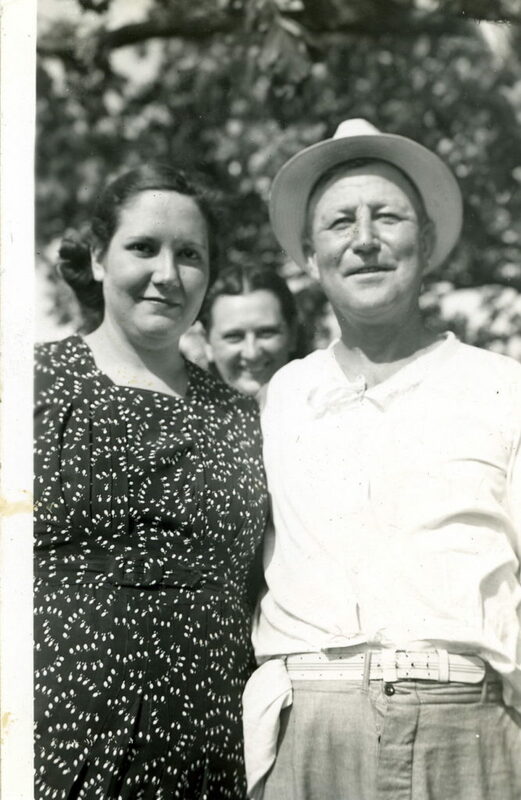 He was very interested in and proud of his ancestors and rightly so – they represent an old German family that immigrated in the early 1800s, worked hard as farmers, and today have many descendants. He most definitely wanted his family history documented and shared, and he knew I, along with a few other members of our family, had a great interest in doing this. The fact that I am adopted made no difference to him – he knew his story is my story too. Because while we might arrive here through a certain set of ancestors, the history we carry forward is not just our own, but also that of those around us with whom we have shared our lives. And genealogy can greatly assist us in this task. Note: For those who were adopted in Illinois, good news! A couple years ago, the state changed the law to allow us to receive our original birth certificate with the names of our birth parents. You can find out more about how to go about getting your certificate by visitinghttp://www.idph.state.il.us/vitalrecords/vital/non_certified.htm. This article is a follow-up to my last post about the FamilySearch.org website and covers some of the remaining features offered by the site. First we’ll go through the Family Tree section of the site. You can get to this by clicking the “Family Tree” button on the home page. Doing so takes you to an interactive tree where you can begin adding your family. When you click the prompt in a box to add someone, FamilySearch offers you a template with space to fill in a name and life event such as birth, marriage, or death. You can also add the names of parents and a spouse. However, you might notice the button to submit this is labeled “Find” rather than “Add.” This is because the intention of the site is to have one massive family tree that everyone contributes to. So when you add someone in your family, the site will look in its existing tree to see if there is a match and offer you a list of people who might be your ancestor. If you find your relative in that list and choose the match, that person along with all the other data already attached to that person is automatically added to your tree. For example when I started building my section of the tree on this site, I was able to add myself and my father. But once I searched for my grandfather, Edwin O. Ochs, I found his information had already been added to the site along with his entire known ancestry back to Valentine Ochs who was born in 1789 in Germany. I wasn’t surprised the information was already there because Valentine’s descendents are numerous, and the genealogy of the family has been well researched and shared with many family members. In contrast, there had been no entries for my grandmother’s maternal ancestors on my mother's side. So I was able to contribute information tracing her ancestry back to my 3X great grandfather, Johann Szwajkowski, who was born in 1804 in Poland. My intention in creating a family tree on this site has not been to use this as my “official” family tree because the site allows anyone to edit any person added to or already found on the site. This prevents me from keeping track of exactly what information is added to an ancestor and ensuring it is backed by a good source. So instead I use this site as a way to discover unknown ancestors or leads I might not otherwise find. If you decide to use the site for a similar purpose, the key is to check out the sources of any information you use from the FamilySearch tree before you actually add it to your own tree that you have set up with your own software package. To check a source of information in the FamilySearch tree, just click a person’s name to see if any sources have been attached. Within my own family tree, I have noticed there were not too many sources in the data that I added from the existing FamilySearch database. So at this point I would be very careful about using any of the information I found there that differed from my own research unless I could verify it with sources. If I do change or add information on their site for an ancestor I found in their database, I do attach a source so people can see where I got that information and why I changed it. Long before the Internet, genealogists relied on accessing the records held by the Church of Jesus Christ of Latter-day Saints through the organization’s Family History Centers. So if records you need have not yet been posted online, you can still view them by requesting the microfilm holding this information. The LDS Church will then send the microfilm to the Family History Center of your choice. When you are notified the microfilm has arrived, you can visit the Center when it is open and view the film. Because a whole article can be written on the Family History Centers, I’ll only focus here on how the online site can help you get this microfilm. To find and order the microfilm you need, choose the “Search” button on the FamilySearch.org website. This takes you to the page we covered in the last article. But instead of putting in our information like we did before to find our relative, this time we are going to choose “Catalog” from the menu bar. This will bring you to a page where you can type in the name of a place where you believe your ancestors lived. As you start typing, several options will show up. You can either keep typing or move down to select one of the suggestions. So by choosing that link, I am taken to a page showing the available microfilm. It looks like there are birth, marriage, and death records available in two microfilms. By clicking the number of the microfilm on the site, I am taken to a page where I can order the film. There are short term loans for 90-days which cost $7.50 and extended term loans for $18.75. Once I make my selection and pay for the loan, the Church begins the process of shipping the microfilm to the Family History Center I chose. After they alert me through email when it has arrived, I can go to the Center and view the microfilm. I have used this method for several branches of families I research and could not have found the information any other way at this time. 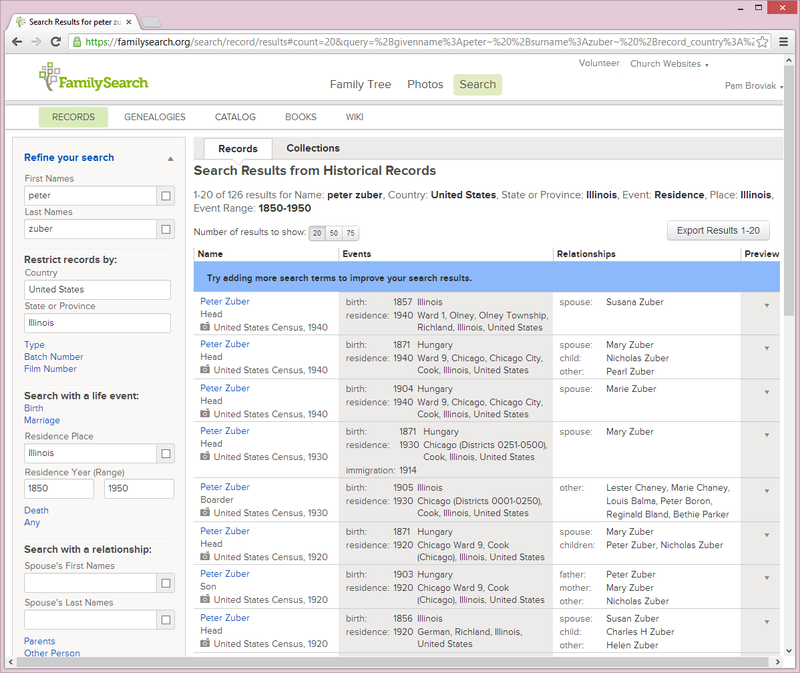 The last feature on the FamilySearch site I will cover is the indexing section. You can access the indexing page by clicking the “Indexing” button on the home page. Indexing is necessary because each record offered online is most valuable if it can be searched by name. But to build that capability, someone has to perform indexing – the process of going through each record and transcribing the names. So FamilySearch has offered genealogists the opportunity to provide that indexing service which helps others in their research and allows those indexing to become more familiar with family records. According to their site, there are 118,055 active volunteers who have transcribed 1,045,371,441 records to date. I have worked on indexing when I get time. What I like about it is that I get to help contribute to the genealogy community, and I am able to see records I might not otherwise become familiar with in my own research. I also am able to participate because the number of records assigned in a group is small and the process can be done at any time in increments. So if I only have 15 minutes, I can work on a few records then come back at a later time to finish up the group I have been working on. In an earlier post I brought FamilySearch as one site offering cloud-based family tree services to genealogists. But that is only one aspect of what FamilySearch offers. So in this article, I'm going to share a few of the other features and benefits you'll find on the site. Then, the rest of the services will be discussed in the next post or two. 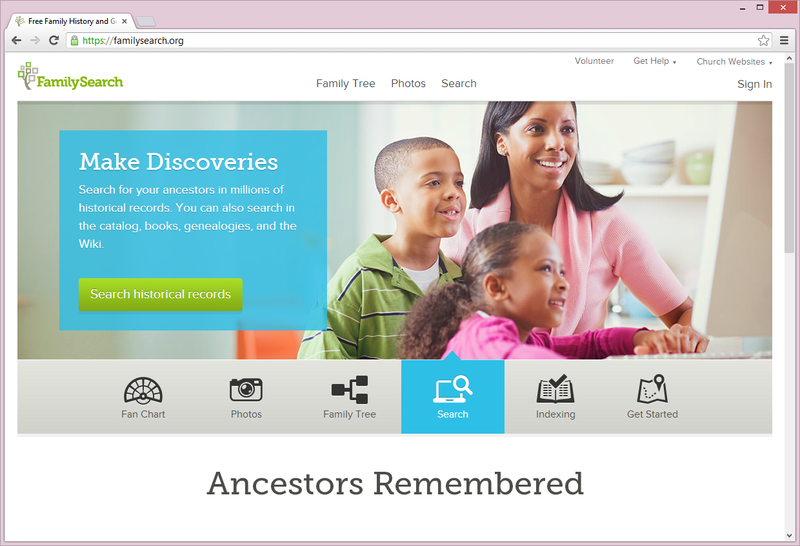 While you are probably anxious to get started on finding out about all the genealogy goodness on FamilySearch, I am going to take a moment to share a quick background of the site. I believe this is important because as you continue in your research you might, like many of the rest of us, realize how much of what you find depends on the work done by others. And the organization behind FamilySearch, The Church of Jesus Christ of Latter-day Saints (LDS), has been one of the most significant contributors of family history information. It's really quite amazing what they have accomplished through the years, and if you are not familiar with the Mormon religion, you might start to wonder why a church would put this much effort into genealogy. The underlying reason goes back to one of the foundation values of their religion – family history. Mormons believe the family relationship can continue after death, but only if families are sealed together through a ceremony held in one of their temples. So church members trace their ancestry to ensure they have identified everyone in their family who needs to be included in the sealing. Because it is necessary to identify ancestors many generations back, church members rely on research of family history documents to build their tree. To help their members in their research, the Church actively collects, indexes, and provides documents online and in many facilities throughout the world. Fortunately for genealogists of all religions, the Church allows anyone to access their documents and facilities. FamilySearch, originally established in 1894 as the Genealogical Society of Utah is, according to their website, "an incorporated, nonprofit educational institution entirely funded by The Church of Jesus Christ of Latter-day Saints." In 1999, the organization launched the FamilySearch online site to make genealogical records easily available online to anyone in the world. The first thing you will want to do when you visit the site is to sign up for an account. There is no cost to create this account or to use any of the online services. While you can search the site without an account, in the end, I've found it best to have one because it allows you to save and share records or attach them to a tree. You will also need an account if you want to make use of the family tree feature. To create your account, just click the words "Sign in." If you don't already have an account, this will take you to a page where you will see a button with the words "Create an Account." Just click that button and fill out the information. Then click the final "Create an Account" button, and you will be sent an activation email. Go to your email, click the activation email from FamilySearch, and you can sign into your account next time you are on the site. To look for records on the site, just click the button labled "Search." This will take you to a screen that should look similar to the image shown. Here you can type in the name of the person in your family you want to research. You can include additional search terms such as a country and birth/marriage/death/residence information to further restrict the results. Usually I start with only a name because you will see that you can always add these other items on the results page. If I get only a few results, I don't bother further restricting the seach because it is easy to go through all the records. But if I get many results, I will then add in other details to weed out people who I know are not related. Here's an example of how I would go through a search for my great-great grandfather, Peter Zuber. If I just put in his name and search, the site finds over 5,000 records from all over the world. Because all of these are not relevant and are too numerous in number to browse through, I need to limit the search. I know Peter was in Illinois throughout his entire life, and I know the range of dates in which he lived. So I will add these on the left of the results page and hit the search button again. (You can click the image in the article to get a larger view.) This brings the results down to 126 – a much more reasonable number for me to browse through. And because I know Peter never lived in Chicago, I can ignore all the entries related to Cook County. As you scroll down the page, you will see on the left side there is a listing of collections. By clicking specific collections you can also limit your results to only show records related to the census, birth, marriage, death, or many other specific types of documents. 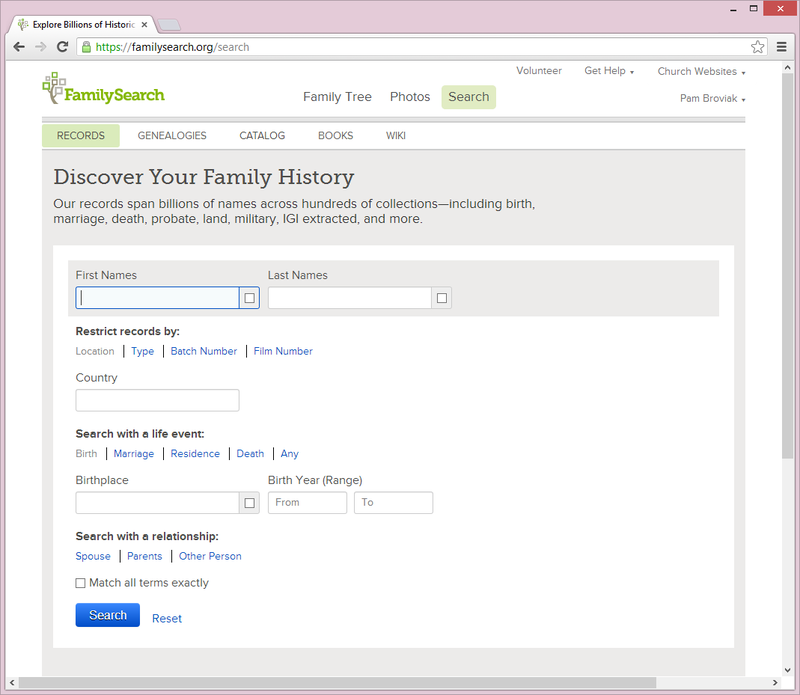 FamilySearch also allows you to search for someone within a specific collection. Rather than beginning with your ancestor's name, you would instead go to the FamilySearch Collection list at https://familysearch.org/search/collection/list. From here you can choose the record you want to search within. There are also filters you can click on the left side to limit collections by type, date, location, or only records with images. For example, if I wanted to search for Peter Zuber within a specific collection, I would begin by clicking "United States" then "Illinois." From here, I would browse the collections to see which he is most likely to be in. Currently there are 22 collections in Illinois available. Some have been indexed so if I access that collection, all I have to do is type in his name to see if there is a record there for him. Other records have not yet been indexed so for those, I would need to browse through the images to see if I could find him on my own. 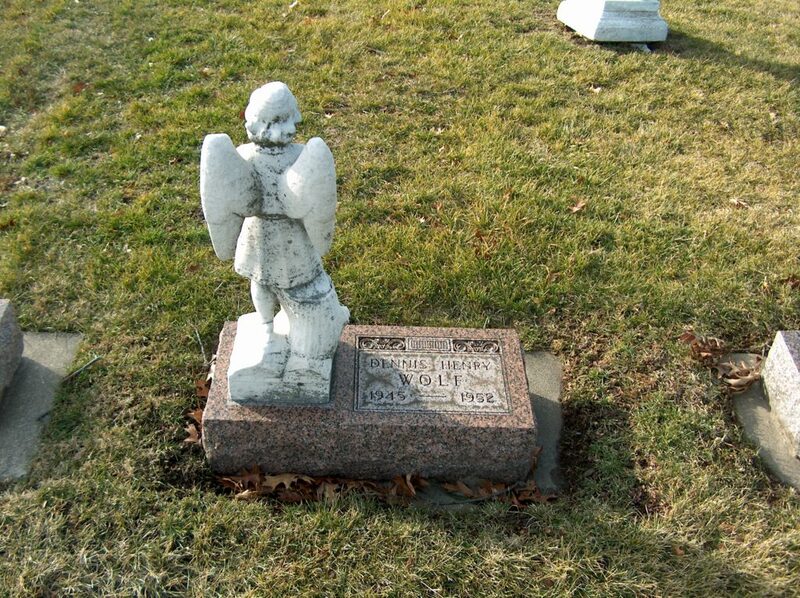 From the list of collections, I will choose the Illinois Deaths and Stillbirths, 1916-1947 set of records. Fortunately this one has been indexed, and a search for Peter Zuber yields 17 results. I know he is from the Olney, Illinois, area so I can click the entry showing that location. While there is no image, the transcription of the record gives me his birthdate and place, his father's name and birth place, his profession, and burial date and place. There is also information I can use to try to get an actual copy of the death record. The collection search feature has been particularly beneficial to me. I was able to find the church records for my birthfamily from a little town in Hungary/Slovakia. This allowed me to take that line back into the early 1800s and opened up other family names in my ancestry. I also like the ability to browse all the images to see the names of other people in their community. Another benefit of both the individual and collection search features is the ability to save a record to a "source box" or attach it to the family tree. 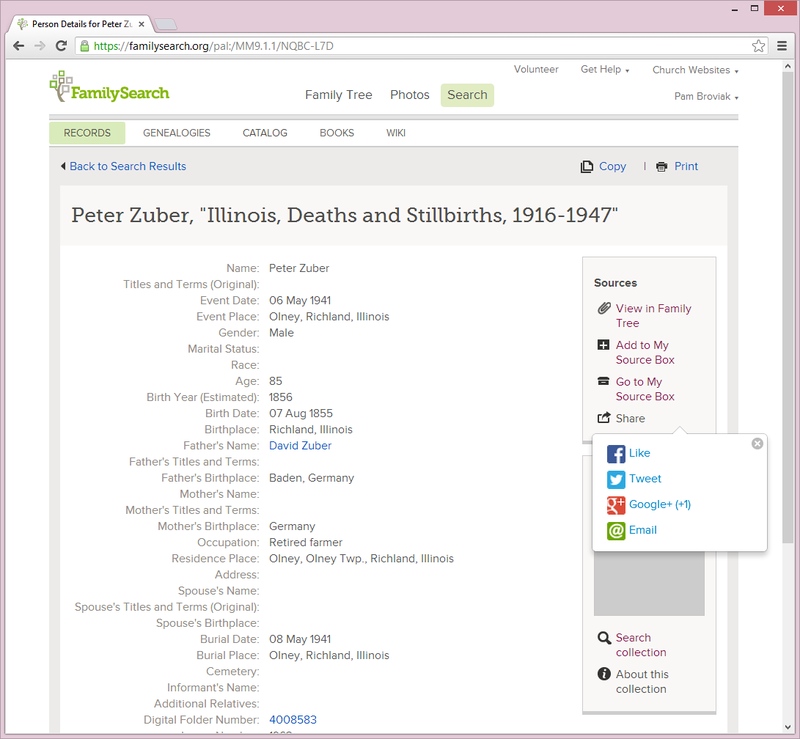 FamilySearch has also added social media functions under a "Share" link on the site so that you can share a record through Facebook, Twitter, Google+, or email. 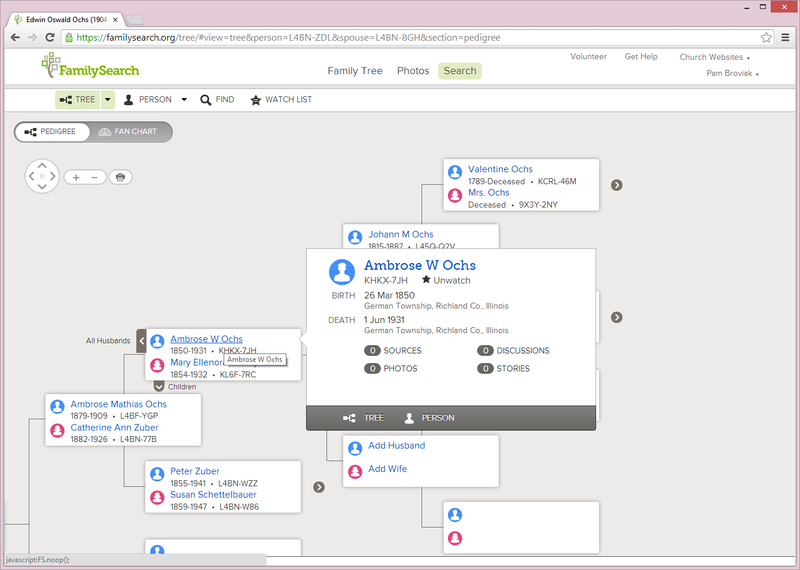 In the next post, I will go through the family tree feature on FamilySearch. In the meantime, if you want to learn more about the site, you can visit the Family Search Getting Started page. 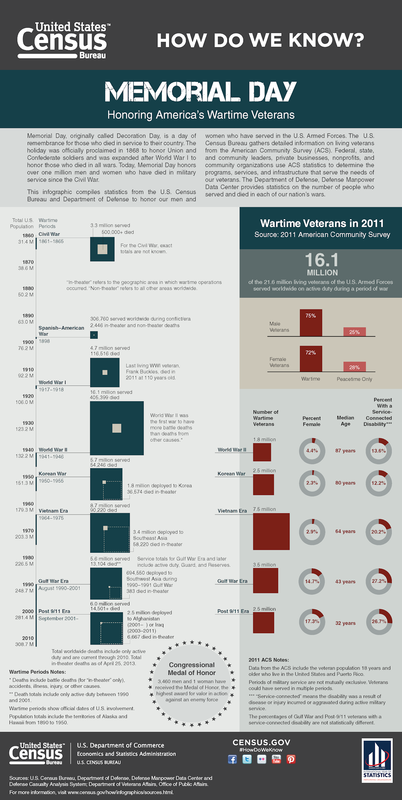 The Census Bureau recently released another infographic illustrating the census over time. For each decade it describes the changes in the way data was collected. You can click the image below to go to the Census Bureau page and pick up your own copy of this in pdf or txt form. Today is the 150th anniversary of the Battle of Gettysburg so I figured I would post a few resources genealogists can use for research or for family histories. Since many of the resources on the Fold3 site seem to have come from the National Archives, it only makes sense to stop over at their site to see what they offer. They have uploaded many of their Civil War photo collection to Flickr – you can find it here: National Archives Civil War Collection on Flickr. The agency also has over 200 photos listed at this link: Pictures of the Civil War. The Civil War Trust website now has an animated video and map with a narration of the entire battle. You can watch and listen to it here: Gettysburg Animated Map. 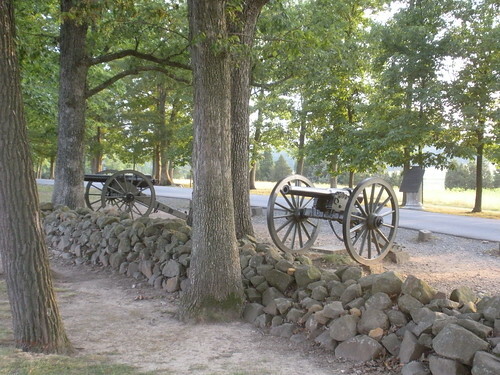 The site also offers video narrations of other Civil War battles. Another favorite site of mine for historical maps is the David Rumsey Historical Map Collection site. Here you can find numerous historical maps from all over the world. The maps related to Gettysburg are at this link: Gettysburg Battle Maps. Fortunately the site offers the maps through a Creative Commons license that allows the material to be reproduced and transmitted as long as it is not for commercial use. There is also an option to embed maps on your own website as shown below. As you can see, this shows Josephine’s parents, Joseph and Frances, married in Krerowo in 1859. So this gave me a location to begin my search in Poland. At this point, I could have ordered the records through FamilySearch.org and gone to my local LDS church to view the microfilm. But with all the families I’ve been focusing on lately, the Szwajkowski’s were not really on my radar screen at the moment. So I logged their marriage and put it all away for another time. 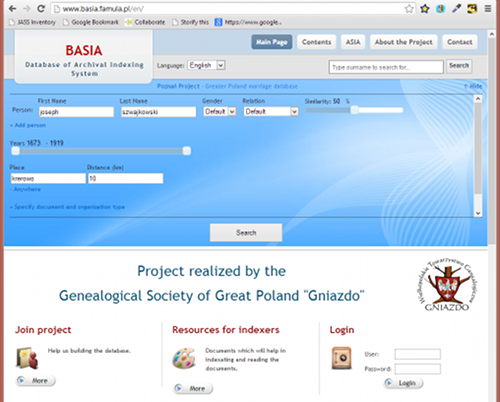 Then the other day when I was at the Poznan Marriage Project site, I noticed a link to the “Basia Database.” So I spent some time checking out the site. 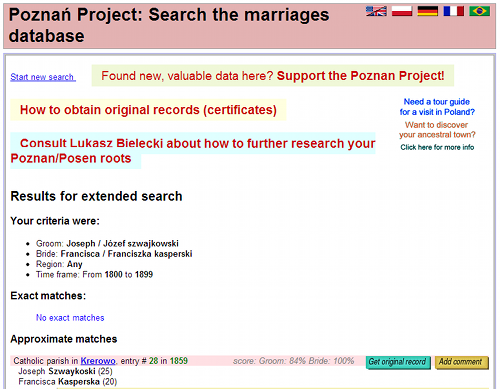 According to the information there, volunteers are currently in the process of transcribing records for births, marriages, and deaths in the Poznan area. Then these records are made available through the site. So far it appears they have primarily covered the southern portion. Seeing that this covered the area near Kurnik and Krerowo, I put in the Szwajkowski name. And I was rewarded with records allowing me to discover many new family members along with a death record for my great great grandfather, Joseph Szwajkowski – Josephine’s father. This listing includes the marriage record for Johann Szwajkowski who is a son of Joseph and Frances and a brother to my great grandmother, Josephine. The listing also shows the death record for Joseph. To view the record, you need to click the little numbers on the right that look like this: 1876/4/82, scan 39. This takes you to a page that shows the actual document. This is the record for Joseph’s death which included the names of his parents, Johann and Marianna Kuzma Szwajkowski – my great great great grandparents! Be prepared though if you find documents for your ancestors – the ones I found appear to be in old German and Polish. Even the handwriting is in an old German Script. I used this site to be able to figure out the letters: Gothic Handwriting. Fortunately, between that site and Google Translator, I was able to figure out what each document said. We are fortunate that there are so many people willing and able to transcribe these documents for us. 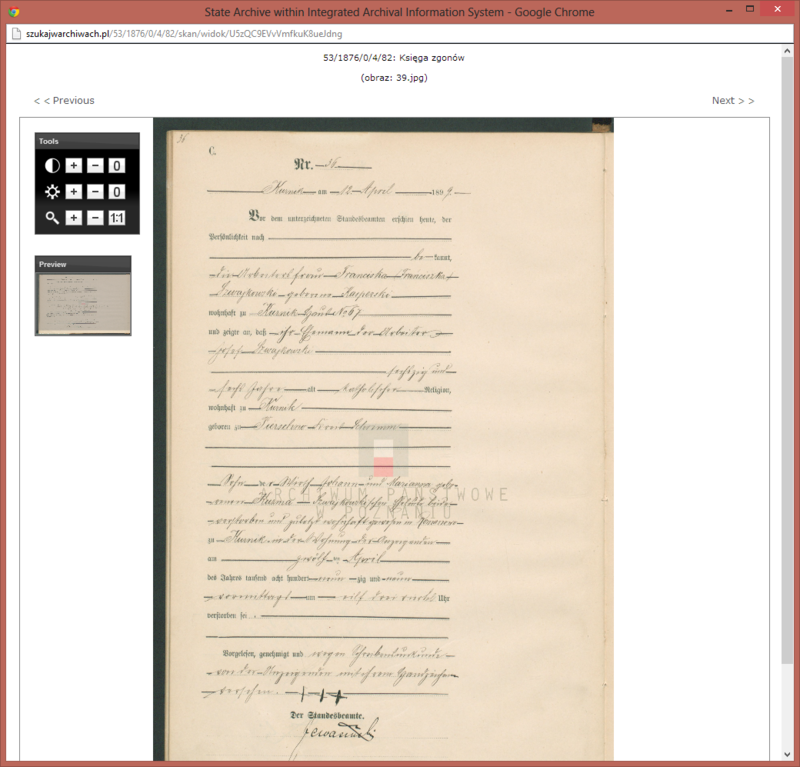 And thanks to the State Archive in Poland for making these records available online. I’ll be eagerly awaiting the results for the rest of the area. 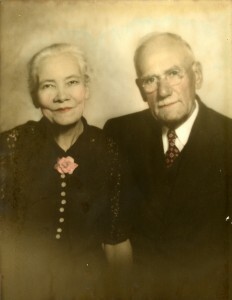 Here’s a photo of my great grandmother, Josephine, and her husband, Joseph Norwich.